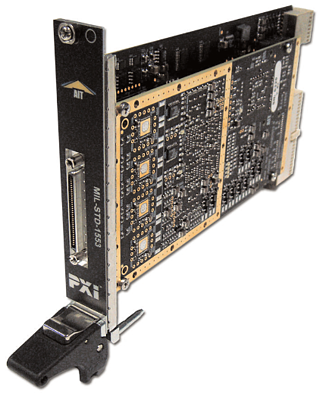 The AIT PXI-C1553 module is a member of AIT's family of MIL-STD-1553A/B Test & Simulation modules. The PXI-C1553 is capable of simultaneously simulating a MIL-STD-1553 Bus Controller (BC), up to 31 Remote Terminals (RT), and a Chronological Bus Monitor (BM) on each channel. The PXI-C1553 provides full error injection and detection capabilities in support of AS4112/AS4111 verification testing.